Specimens and restorations of larva, early transformer, and adult of M. Menae, showing its three-phased life cycle. Credit: Proceedings of the National Academy of Sciences. Today, the Proceedings of the National Academy of Sciences published a description of fossilized lamprey larvae that date back to the Lower Cretaceous—at least 125 million years ago. They're the oldest identified fossils displaying the creature in stages of pre-metamorphosis and metamorphosis. "Among animals with backbones, everything, including us, evolved from jawless fishes," said Desui Miao, University of Kansas Biodiversity Institute collection manager, who co-authored today's PNAS paper. "To understand the whole arc of vertebrate evolution, we need to know these animals. The biology of the lamprey holds a molecular clock to date when many evolutionary events occurred." Miao said features of the human body come from the jawless fishes, such as the lamprey, a slowly evolving organism—often parasitic—which has inhabited Earth at least since the Devonian, about 400 million years ago. "For example, a jawless fish such as a lamprey has seven pairs of gill arches, and the anterior pair of these gill arches evolved into our upper and lower jaws," he said. "Our middle ear bones? They come from the same pair of gill arches." Indeed, lamprey evolution sheds light on the development of all animals with a backbone. Because of this, scientists have yearned to discover more history about the stages of the aquatic creature's three-phased life cycle. "They just don't have hard parts," Miao said. "Even fully developed fossil lampreys are rare because they lack skeletons. Most fossil fishes are bony fishes—fish we eat and leave bones on the plate. 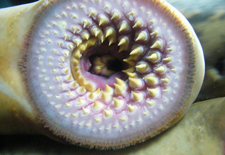 But lampreys don't have bones or teeth that can be preserved as fossils." Fortunately, during the lush Lower Cretaceous era, freshwater lakes covered Inner Mongolia. These waters were chock-full with the ancestors of today's lampreys, and many fossils became beautifully preserved in a layer of late-Cretaceous shale, including larvae. "This type of rock preserves very fine details of fossils," Miao said. "The same rock preserved evidence of dinosaur feathers from this era. The lamprey larvae were found by local people and some by our Chinese colleagues who specialize in early fishes." According to the KU researcher and fellow authors Meemann Chang, Feixiang Wu and Jiangyong Zhang of the Institute of Vertebrate Paleontology and Paleoanthropology at the Chinese Academy of Sciences in Beijing, the larval fossils show the life cycle of the lamprey "emerged essentially in its present mode no later than the Early Cretaceous." "Our larvae look modern," Miao said. "The developmental stage is almost identical to today's lamprey. Before this, we didn't know how long lampreys have developed via metamorphosis. Now, we know it goes back 125 million years at least. In other words, lampreys haven't changed much—and that's very interesting." Then, like today, lampreys lived in both freshwater and saltwater. At the larval stage, they'd have dwelled in the sand or mud and drawn nutrients from micro-organisms in the water. Then, as mature lampreys, some of them would have subsisted by fastening themselves to host organisms and swigging their blood—often killing their host in the end. "They attach to larger fish or whales," Miao said. "They hold on forever."